Once again it is my pleasure to present a recently published article from the Doctor Who Appreciation Society's magazine Celestial Toyroom. Just published in the Christmas issue 380/381(with a splendid Target books homage by cover artist Lee Carey), this is a companion piece to the earlier essay on design in the Classic Series, which you can find here, that covered the work of Peter Brachacki and Ray Cusick. Part 1 / Cyber Suits You, Sir! As Doctor Who cemented its popularity and continued into the late 1960s, it wasn’t just the leading man that underwent a bit of a change. As William Hartnell became Patrick Troughton, the series also emerged from a post-war European aesthetic where Daleks, spaceships and stiff upper lips all reflected Britain’s desire to at least be seen as a player on the political world stage whilst subtly exorcising its various, collective demons of the Second World War. To an extent, the early years of the series, in terms of its design at least, were still trying to shrug off the austerity of the 1950s and reach back to a pre-war European design intellectualism. By the time of The Chase, Hartnell’s hip-ness was simply, and rather embarrassingly for the production team, reduced to featuring a clip of The Beatles on the TARDIS’ time/space visualiser. Ironically, in that very moment, the programme saw its own future. Those loveable Liverpool mop-tops, in hindsight, tell us more about the incoming actor Patrick Troughton and what the series would become, narratively and visually, than they do about the soon to be departing Hartnell and the previous two years of adventures. The thaw in the series own attitude to the zeitgeist of the 1960s can also be seen in The War Machines. It’s not only an early template for the now instantly recognisable format of Earth-bound contemporary adventures that would become the yardstick for the series’ own narrative but it’s also an indication of how the Wellesian science fiction romance of the first three years of the programme was starting to give way to the rapid cultural changes that Britain in the mid-1960s was undergoing. The scenes in the Inferno nightclub, whilst suggesting the growing distance between Hartnell’s portrayal of the Doctor and the younger members of the audience by positioning him as a truly out of step and out of time figure, at least demonstrate that the visual identity of Britain in 1966 was very different from that of 1963 in An Unearthly Child. It’s clear the world had moved on since the departure of Ian and Barbara in The Chase. Taking this analogy a little further, how Ian and Barbara, away from contemporary Britain for three long years, would potentially negotiate their way through, and accept or not, the changes in culture and politics is exactly the journey that the series itself would undertake from 1966 onwards as the producers took the extremely bold move of replacing their lead actor. In the end, Troughton represents both the huge cultural shift in the way the series would engage directly with the audience and the how such an audience would process the explosion of new British and European style, ideas and politics. Whilst we may utter the cliché ‘the swinging sixties’ and pay lip service to The Beatles, we must remember that the period was overshadowed by the threat of nuclear war and the assassinations of JFK and RFK, Martin Luther King and Malcolm X. It could be said that, for Britain particularly, it was the death of Winston Churchill in 1965 that represented the extinguishing of the last embers of Empire. A new Britain was already waiting in the wings. Violence, fear and, indeed, revolution was reflected in all the new, exciting, radical, and subversive events and trends of the period. New forms of artistic practice were explored in an attempt to redefine the artist’s role in society. The way design shifted from ‘form follows function’ was a key influence in the way consumer culture developed in a period of radical political change as 32 countries gained independence from their European colonial rulers. The visual art, design, music, literature, cinema and television of the 1960s, unlike the 1950s, was not about looking back and they acted as articulations of how a rigid culture, unable to contain the demands for greater individual freedom, broke free of the social constraints of the previous age through extreme deviation from the norm. If you look at a list of the technological developments that occurred in the decade there is an insight into how rapid the changes were since the start of Doctor Who in 1963. The contraceptive pill, the first working laser, human space flight, satellite broadcasting, advances in computing, a prototype internet. And the future arrived on Doctor Who through the appointment of Christopher Magnus Howard "Kit" Pedler by producer Innes Lloyd and script editor Gerry Davis, both of whom had been seeking to take the show away from what they saw as 'whimsy'. Pedler’s influence was soon felt in his ideas about humanity’s increasing dependence on computers in The War Machines and with the creation of the Cybermen, a symbolic fear of the dehumanising effects of replacement surgery, in The Tenth Planet. The way the appearance of the Cybermen was changed and adapted over the period of 1966-69 in part summarises some of the responses being made by costume designers on the show to the cultural zeitgeist of the late 1960s. The original design for the Cybermen was by Sandra Reid, later known as Alexandra Tynan, trained in Fashion and Textiles at Belfast College of Art before moving to London in 1963, where she worked in the costume departments of the Royal Shakespeare Company, the National Theatre and most recently, as Head of Costume at the Glyndebourne Festival Opera, one of the world's leading opera houses. She was employed at the BBC from 1964 to 1968, sharing an office with fellow costume designer Daphne Dare in 1966, and it was her original designs that featured in The Tenth Planet and that she later continued to adapt in The Moonbase and Tomb Of The Cybermen. The original design, of a full jump suit of blue jersey with a plastic body suit overlay, was augmented by the iconic headpiece with plastic handlebars and lamp, the chest piece and various amounts of tubing and wiring. It’s entirely possible that Reid’s ideas for the look of the Cybermen, from their original design through to the many variations produced by her and later by costume designer Martin Baugh during the 1960s, was informed both aesthetically and philosophically by the simultaneous developments in art, fashion, design and science of the period. The notion of cybernetics, the science of control and the development of systems of control, didn’t really have a huge amount to do with what the Cybermen actually looked like and likely informed their philosophy whilst marching across the moon or popping out of a sewer. They are best described as cyborgs, part man and part machine, feeding into Pedler’s own ruminations on the development of prosthetic limb replacement and spare part surgery with their legacy stretching back to Mary Shelley’s Frankenstein and the robot Maria from Lang’s Metropolis. Media guru Marshall McLuhan’s ideas about technology becoming prosthetic extensions to the human form clearly informed the pioneering work of British architectural practice Archigram (cybernetic buildings), Australian interactive architecture collective Coop Himmelblau (early experimental works included “Soul Flipper”, a face helmet that was sensitised to react to movements of facial muscle and skin to transmit optical and acoustical signals) and the experimental performance art of Krzysztof Wodiczko with his Personal Instrument (a piece that could isolate the wearer from the effects of environmental sounds) that looks for all the world like a prototype Martin Baugh design for the Cybermen as seen in The Invasion. A number of technological leaps were being made at the time about which Pedler expressed his fears through the Cybermen. Patents for a head mounted stereophonic television display had been filed at the US Patent Office in the same year that Manfred Clynes and co-author Nathan Kline first coined the phrase "Cyborg" in a story called "Cyborgs and Space" published in Astronautics (September 1960). By 1966 Bell Helicopter Company performed several early camera-based augmented-reality systems. In one, the head-mounted display was coupled with an infrared camera that would give military helicopter pilots the ability to land at night in rough terrain and in 1967 Hubert Upton invented an analogue wearable computer with eyeglass-mounted display to aid lip-reading. In the fine arts, an early project from the Viennese group Haus-Rucker-Co in 1968 created a series of helmets that disengaged the wearer from the entire world. 'Flyhead', 'Viewatomiser' and 'Drizzler' were conceptual helmets to repress the senses. Designer Sandra Reid also could hardly have missed the explosion of creativity going on in the world of fashion in 1966. New materials were also being produced with Crimplene and Trevira arriving in 1961 and happily joining the other synthetics such as Acrilan, Bri-nylon, Orlon, vinyl and PVC which provided a whole new design medium for fashion garments. The Fashion Writers Association had started the Dress Of The Year awards in 1963 and the ensemble chosen by Ernestine Carter, Fashion Editor of The Sunday Times for the Dress Of The Year in 1966, included a clear PVC coat by Michele Rosier of V de V for Young Jaeger; a hat by Simone Mirman and boots by Elliott that are all suggestive of the jersey and plastic combination that Reid put together for the first appearance of the Mondasians. John French was one of London’s top fashion photographers of the 1950s and 1960s, an era when those who wore and photographed clothing for a living could become famous overnight. French persuaded the art editors of the national press to use his flawlessly lit images of top models and his work appeared in virtually every newspaper and magazine. 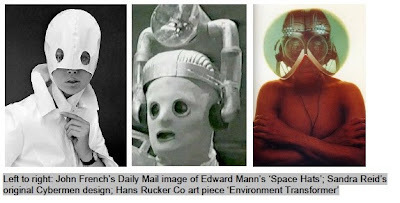 A key image appeared in a Daily Mail fashion spread in 1965 under the title of ‘Space Hats’ where he presented a model wearing one of Edward Mann’s white PVC helmets, to accompany a white PVC coat, and where the helmet covered half the model’s face with her eyes peeping through two round holes in the material. The hat, akin to the Cybermen design, echoed the iconic ‘tear drop’ modification to the Cybermen helmets in The Wheel In Space. This tapped into prevailing urban mythology about tear drop facial tattoos signifying that the wearer had been incarcerated and or had killed someone whilst in or out of prison. However, it has over time come to symbolise a friend or fellow gang member or family member that has died while the wearer is incarcerated. Design, especially fashion, architecture and industrial design, embraced the twin concerns of 1960s society – looking optimistically forward into the future, egged on by NASA’s progress in landing a man on the moon, with a quiet agonising about the Cold War and hope for protection against the spectre of nuclear war. The imagery of the Cybermen and the couture of the times reflected the fear of nuclear war in the gas-mask like aesthetics of helmets and futuristic plastic survival suits as well as Pedler’s notion that advanced humans would replace their entire bodies with plastics and metal. Early US space suits, another major influence on the look of the Cybermen, were adapted from pressure suits designed for pilots of high altitude military and experimental aircraft. The first designs for use in space were the American A7L and Soviet Krechet suits. These were designed for walking on the moon during the space race of the 1960's and provided the basis for those used aboard space station and shuttle missions. There is also the development of the humble wet suit to consider too. 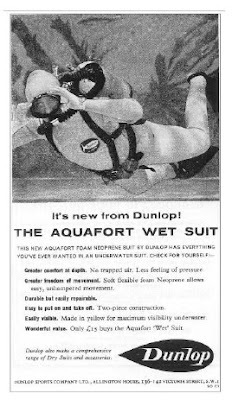 In the early 1960s, the British Dunlop Sports Company brought out its yellow Aquaforte neoprene wetsuit, whose high visibility was designed to improve diver safety. Now the foam rubber was sandwiched between two protective fabric outer layers, greatly increasing the tear-resistance of the material. An external layer also meant that decorative colours, logos, and patterns could be made with panels and strips sewn into various shapes. 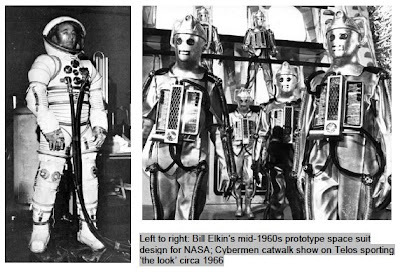 The development of the space suit and the wet suit from the 1960s to the 1980s resembled the Cybermen design similarly evolving from the jersey and vinyl outfits of The Tenth Planet, the looser silver boiler suit of The Moonbase through to the silver wetsuits of The Invasion and The Wheel In Space, all augmented by furniture coverings, vacuum cleaner tubing and practice golf balls to complete the iconic look. By the 1980s, the men from Mondas (or Telos, take your pick) were also getting serious with modified flight suits.